A transit of Venus is one of the rarest of all astronomical events. It occurs when the orbit of the planet Venus take it between the Earth and the Sun. Our generation is very fortunate to have two such transits occur in our time. My grandparents, born between 1901 and 1910 never saw a Venus transit in their lifetimes. The last transit was in December 2004, the next on June 5th/6th, 2012. Transits don't occur every 8 years. They occur in pairs separated by 8 years with more than a century gap separating each 8 year pair. The next pair of Venus transits occur over a century from now on 2117 Dec 11 and 2125 Dec 08. The last pair were in 1874 and 1882 and the pair before that were in 1761 and 1769. Observing and timing the 1769 transit was the main reason that Captain Cook and Charles Green were appointed by the Royal Society to travel to Tahiti in 1769 (see sketch right). After the transit on the return voyage, Cook searched the South Seas for months looking for the great southern continental land mass, Terra Australis, that it was thought was necessary to balance the great continental masses in the northern hemisphere. There was no such continent but in the process, he stumbled upon Australia. Why would I come all the way to Australia? The map below shows the global visibility of the transit superimposed on the global cloud cover map for June. (sources : transit visibility map by Fred Espenak, NASA/GSFC, cloud cover map courtesy of Jay Anderson/ISCCP). Examination of the map shows that the entire transit is visible from the west Pacific rim. A large part of the world will see either ingress or egress and part of the transit. SW and NW Africa and much of South America miss out completely. Within the area that sees the entire transit, Northern Australia stands out as possibly the clearest place to observe the transit of Venus. Viewing geometry is not ideal, but when general viewing conditions and weather prospects are taken into account north central Australia probably comes out on top. The only region in the world with very low levels of cloud cover and a view of the entire event is north-central and north-east Australia. Transit visibility is provided by Fred Espenak in this cloud map by Jay Anderson. The chart above shows the average June afternoon cloud cover in percent. Data were extracted from satellite imagery acquired between 1982 and 2007 and have a resolution of 0.5° in latitude and longitude. Cloud amounts should be used with caution, as satellite observations are subject to many biases; relative cloudiness is more reliable than the absolute cloud percentages. Northern Australia is the best site for viewing the entire transit. Excellent sites for viewing a partial transit can be found in the southwestern USA, the Middle East, and Madagascar. Obviously this is a low resolution map and smaller areas with good weather prospects may exist elsewhere. From the north east Australian region, the transit begins in the morning in winter. The altitude is a little low, around 11 degrees at internal ingress through to 31 degrees at internal egress. But being located in a position when internal ingress occurs quite early in the morning, you can expect better seeing and less air turbulence from rising heat. Normally, such a trip would provide an opportunity to take in some of the dark southern skies this region is so famous for. Unfortunately, full moon occurs two days before the transit on June 4th. There is a partial lunar eclipse this day visible in its entirety from this area but you will be waiting a few days before you'll get a short window of dark evening sky. When that dark sky window does open, the rich region near the Southern Cross and Carina is up as soon as it gets dark. The rich southern Milky Way rises at sunset. 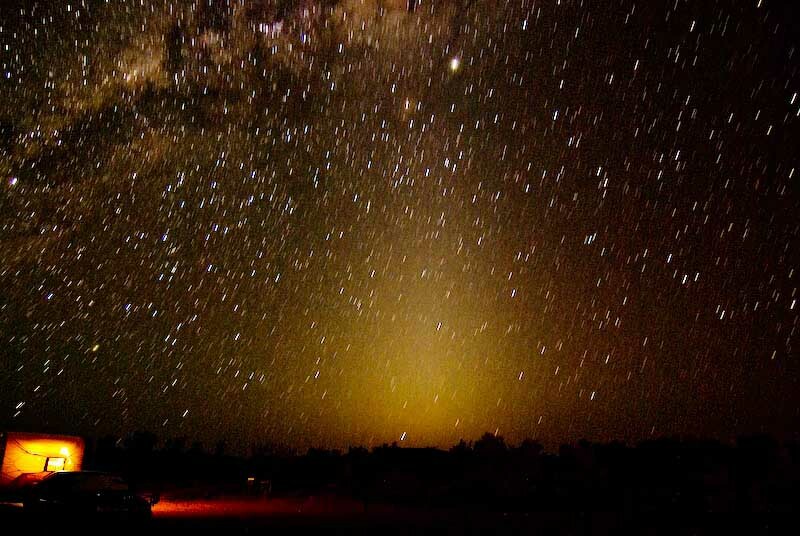 The Southern Milky Way with Zodiacal light photographed from Central Australia. Observations & sketches made by Mr Charles Green, former assistant at the Royal Observatory at Greenwich and Lieutenant James Cook of the Bark Endeavour in Tahiti during the transit of Venus of 1769. Philosophical Transactions of the Royal Society vol 61, p410, 1771.